Bahauddin Zakariya University BZU Multan BA Result 2019 will be announced soon. We are advised to all students to keep in touch fro BZU BA Result 2019. There are lot of students that are studying under the umbrella of Bahauddin Zakariya University and all ba students were waiting for their results and now are able to get online on ilmkidunya. Respective students of BA are wished best of luck for the final exam’s result. The moment BZU will issue the result it will be displayed right at this page. Get the most recent result updates by staying connected with the most favorite website of Pakistan. In 1975 the organization of BZU Multan was made and since then the organization of bachelors and masters level exams is the responsibility of BZU Multan for the students of Multan and its affiliated zones. BZU is located at a distance of 10 km from the city center. More than 30 departments/institutes/colleges are functioning in the university. Students from far flung and remote areas come for the final exams of graduate and masters level. At this time the exams of BA are over and papers are being checked by the qualified teachers. BZU BA Result 2019 will be declared soon in the month of August 2019. Students waiting to get the result must be stay connected with ilmkidunya. Once again students of Bachelors of Arts are informed that BZU Multan BA Result 2019 will be declared in the month of August. Result awaiting hopefuls could download the BA result and due date right at this page. Keep connected with this page for most recent updates of BZU result 2019.
plz b.a supply result kab a rha hy......plz agr kisi dost ko pta hy kia . . . . ???? BA supply ka rezlt kb aa eha h?? 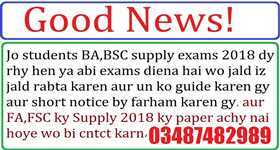 any one tell me about the result of B.A supplementary exam 2018 held in November.